The elbow is a common site for repetitive stress injuries and can be a contact point for more traumatic injuries, such as a fall. The elbow is made up of your humerus, radius and ulna. The muscles of your forearm flex and extend your wrist. With your palm up and your hand on the outside of your elbow, move your wrist down, or extend it. You will feel the extensor muscles on your lateral epicondyle contract. Now move your hand to the other side of your elbow and move your wrist up, or flex your wrist. Now you will feel the flexor muscles of your medial epicondyle contract. A common injury to the elbow are lateral epicondylitis (tennis elbow) and less common medial epicondylitis (golfer elbow). 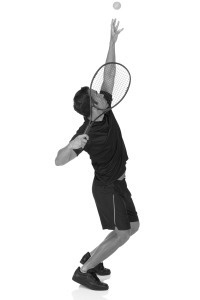 As the name insinuates many tennis player get tennis elbow, however anyone involved in racquet sports is at risk. Also, if you spend your day at the computer and your wrist are held in an extended position to reach your keyboard you may also develop lateral epicondylitis. Many golfers reports medial epicondylitis, but the injury is not limited to that sport. Treatment for these injuries often consists of soft tissue mobilization, stretching, strengthening and most importantly movement modification to prevent re-injury. Often times, we are over using the wrist to gain range of motion that we should be getting from another joint or it’s a lack of strength to maintain a strong neutral grip. So your physical therapist will assess your desk ergonomics and in the case of sports your swing mechanics. Now as your pain decreases, you will also be stronger and have better mechanics to prevent re-injury. In the case of golf, maybe you will even hit the ball more accurately and with a few more yards. If you have specific questions about your injury please feel free to give us a call at (908) 276-0294.